Bronson. Deathwish. Yes. Michael Caine? Hmm.. we'll see. Harry Brown is already winning praise for being the Brit's answer to Eastwood's Gran Torino and while it looks like it may deliver the goods, we're still on the fence in terms of Caine's ability to turn on the surly. I think it's because he's been turning in so many cuddly-old-guy roles lately and we want Get Carter back. 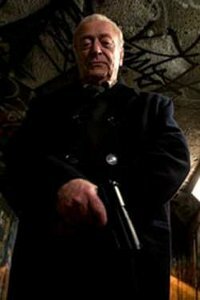 Harry Brown is the feature directorial debut from Daniel Barber, whose only other film is a short called The Tonto Woman. It stars Michael Caine, Emily Mortimer, Iain Glen and Amy Steel. I watched Talking movies, where they have interviewed him, he is a magnificent person. He went in his old neighbourhood to canvas and gather sets, sights and sounds for the movie, alone, so a bunch of black guys approach him, asking what does he want in their neighbourhood, which he politely answered, I was born here, 300 m down this street, and they like puzzled, understanding who he is finally, tell him their stories. AMAZING guy, which makes amazing movies. CARTER is back, in color with a vengeance! Michael Caine is an actor's actor. Anything he touches is better for it. I'm looking forward to this film. Looks good.